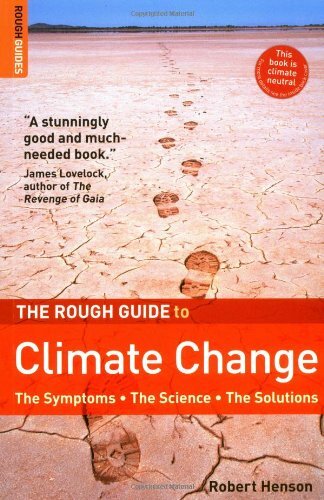 Global warming is likely to be a growing concern for everybody in the coming years, and this book is a useful addition to the growing literature aimed at helping readers to understand this phenomenon. The first part of the book is a brief overview of Global Warming, but it's the following two sections form the bulk of the book, and are packed full of information on the subject. Part 2 looks at the symptoms we are likely to see if Global Warming takes hold. Disastrous heatwaves such as the one which affected Europe in 2003 may become much more likely. Along with heat goes drought and there is likely to be desertification in many places. However, a change in climate can also cause problems due to excessive rain, and in particular an increase in hurricanes and other storms. The melting of the polar ice-caps is a well known effect of global warming, but on top of that the warming of the oceans is likely to dramatically affect ocean currents, which could cause all sorts of problems. One scary possibility for those of us in Britain is that the Gulf Stream will 'turn off', leading to much colder winters - something we would find very hard to deal with. All of these changes will cause problems for animal and plant life, and the last chapter of this section looks at the ecological effects of global warming - many species are likely to become extinct - as well as the problems that climate change might pose for agriculture. The third part of the book examines the science of climate change. Its all very well to talk of the global temperature increasing, but to measure this requires making measurements at a significant number of places and times, and then extracting a pattern from the results. There is a chapter looking at these issues - the technology which is used to keep track of the weather, and the possible errors which may arise from the variation in the way it is measured at different times and places. The next chapter examines climate in the longer term, showing the methods which are used to find out how climate has changed, and looking at the reasons for this change. Certainly there have been significant changes throughout the last millennium, but it is also possible to look back tens or hundreds of thousands of years to the ice ages and interglacial periods. It is thought that variations in the Earth's orbit play a significant part in these. Looking even further back to tens or hundreds of millions of years ago indicates the effects of the movement of continents of the global climate. Looking this far back shows that there have been times when the world was significantly warmer than at present, but that such a world was very different to the one we live in now. The last chapter of this part deals with the modelling on climate by computer, showing how models have developed over time, as well as the problems with such models. To include the effects of things such as clouds and ocean layers means a detailed model is needed, and to get a reliable answer requires it to be run many times with slightly different inputs. This adds up to a lot of computing time. However, such computations have been done, for instance via the ClimatePrediction.net project, and they seem to be leading to a consensus that a doubling of carbon dioxide levels over historical values will lead to a global temperature increase of 3 or 4 degrees Celsius. There is a limit to how much can be included in one section of a fairly short book, and those who are particularly interested in the science of climate will probably want to read books dedicated to the subject, but the information in this part of book is helpful for those wanting a summary of the issues. Part 4 of the book is titled 'Debates and Solutions'. It looks at how the arguments over climate change have progressed. There are environmental activists who stage protests to emphasise that not enough is being done, but there is also a vocal minority of sceptics who deny that human activity is causing changes to the climate. Media coverage of the subject often just looks at the views of these two groups, rather than showing the gradual achievement of consensus and slow policy changes. The book goes on to look at which countries might have the political will to implement the changes required to combat global warming, such as those specified in the Kyoto agreement. It then examines some of the technologies available to do this. A greater use of renewable energy is one option, but there are also those who call for an expansion of nuclear power generation. If we want to carry on burning fossil fuels then sequestration of CO2 might be an answer. We also need to reduce our energy use in buildings and transport. This leads on to the question of what we as individuals can do to combat global warming. However I thought that section advising on actions for readers themselves to take was too short, and doesn't go much beyond what the reader will have heard elsewhere. Henson refers the reader to other books such as the Rough Guide to Ethical Living - I felt that more was needed here if the aim is to help people to make informed choices on how to combat climate change. I wasn't so convinced about the book being published as a 'Rough Guide'. Although this format is useful for packing a large amount of information into a small book, with separate boxes dealing with various topics it makes it more difficult to read it straight through. Also it rather implies that the information will include plenty of advice on things for the readers themselves to do, which was something I felt to be lacking. Hence I wouldn't expect it to win the General prize of the 2007 Royal Society Prizes for Science Books. On the other hand it does deal with a complicated subject in an non-technical way and I felt it was especially helpful in allowing the reader to see beyond some of the simplistic ideas which are often provided by the media.